CENTRAL PA RACING SCENE: Can someone please pass the salt??? Does anyone have some salt I can use? I need it for the big plate of crow that I'm about to eat. Last November I penned this article http://boogermac.blogspot.com/2013/11/lance-dewease-is-new-driver-of-dietz-14.html and now its time for me to admit I was wrong, way wrong. This past Saturday night at Williams Grove Speedway Lance Dewease not only took home the Summer Nationals against the best in the business the World Of Outlaws, scoring the $20,000 first prize check, winning his 3rd race of the season, scoring his 300th career feature win, he did it in a car I said he was going to need a lot of luck in just finishing races in. BOY WAS I WRONG. Lance has shown me that not only is he one of the best drivers in our area, but he is one of the best drivers in the country. Now when I wrote the article back in November Lance was coming off one of his worst season ever in a sprint car, winning just 2 features in 2013 in one of the best cars in Central PA , the Heffner 27. But history should have shown me that you can never count out a driver like Lance Dewease. A sure fire first ballot Hall of Famer. After Lance and the 27 team did not click last season, Lance decided to try his luck with a team that had not had much success in the Dietz 14 car. Lance has struggled at times in the 14 car, and that was to be expected when jumping into a new ride with a new team, but not only has Lance proven he is still capable of winning races, 1 at Susquehanna Speedway (which was the 1st win for the race team) he backed that up 2 weeks ago with his 2nd win of the season at Lincoln Speedway. Those win while not a surprise as he is Lance Freaking Dewease, the team has struggled big time on the big half miles. Lance was a DNQ at Port during Speed Week. Which leads us to this past weekends WOO invasion. Thursday night at Lincoln Lance was a DNQ at the track which had won at just 5 days earlier. Friday night Lance put it in the show but could only manage a 16th place finish. Not a bad finish when your racing against the best in the country, but this is Lance Dewease. 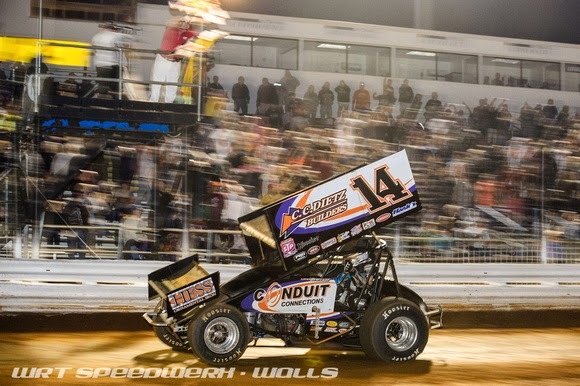 You know the guy who has won 9 career features at Williams Grove Speedway against the Outlaws, with 3 of those wins coming in the National Open. Saturday night Lance showed that he still has what it takes to win at the Grove and proved all the naysayers wrong and made sure we would all be asking the same thing this week....Please pass the salt. Saturday night proved that all it takes is the right driver at the right time, in the right car, to make any team a winner. I should have known from the start Lance Dewease was that driver, hell we all should have. Never again will I ever question Lance or the Dietz team. 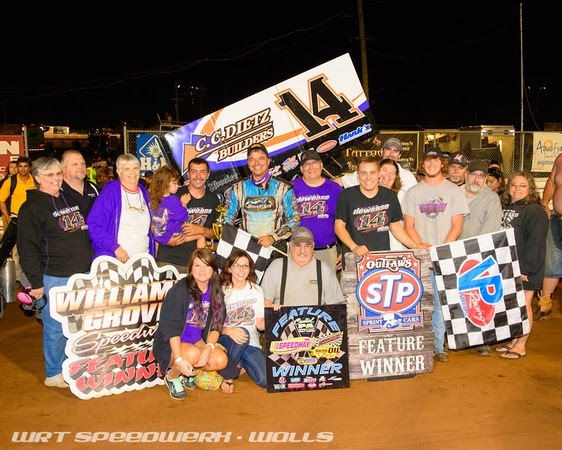 Lance has earned that with his HoF career, and the Dietz team has earned it by becoming one of the best teams in Central PA.
Congratulations to everyone involved with the Dietz 14 team. You guys and Gals deserve it. Now does anyone have any A1 I could use? This Crow sort of taste like steak.